Media Temple began operations in 1998 and has thrived on its ability to embrace emerging trends ever since. The company hosts more than 1.5 million sites for clients spread across 100 countries. Over time, Media Temple has created a diverse clientele consisting on individual bloggers as well as small and large businesses. Media Temple claims to offer end-to-end customer support through a variety of channels. The company’s commitment to customer service can be assessed from its claim that employees at the company spend almost 90 per cent of their day addressing customer queries and complaints. The customer service team is based in the United States and operates 24/7 throughout the year. Customers can send in their queries through live chat support, telephone or by using the ticketing system. In addition, Media Temple operates a helpline on Twitter where clients can post queries and receive immediate support. This is one of the features that sets Media Temple apart from its competitors. Media Temple owns and operates two data centers in the United States—one at Ashburn, Virginia and the other at El Segundo, California. The Ashburn data center is spread over 300,000 square feet and organized into 20 individual server rooms and has been operating since 2007. Each server is server by its own dedicated electrical power system to minimize any risk of server disruption. The data center has its own 34.5 kV power backup and 32 diesel generators, cooling system with a maximum capacity of 8860 tons, fire protection, and armed security. The data center at El Segundo is spread over 7000 square feet and is monitored by a bulletproof security post. It comes with its own power backup supported by two standby generators and six UPS systems, cooling system with refrigeration capacity of 3350 tons, fire protection and armed security. Media Temple incorporates the latest technology in its web hosting packages. For instance, clients are offered scalable bandwidth which allows the company to manage surges in web traffic efficiently. It also offers the Smart Pool system through which database resources are shared efficiently among clients. Media Temple maintains a convenient account center through which apps can be installed in no time and clients can manage multiple email accounts from a single location. A unique feature offered by Media Temple is the business email service where clients get up to 1000 email ids in all domains. Clients can also use a user-friendly interface to manage contacts, emails and appointments as well as operate desktop applications and programs. Media Temple offers more than 100 GB of disk space along with 1 TB bandwidth to clients. Each host has the capacity to host up to 100 distinct websites and domains. The web hosting is enabled by PHO 5.5, FastCGI and other latest technologies to provide the best speed and security to clients. 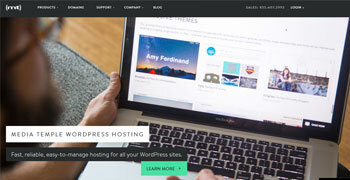 WordPress hosting consists of 4 plans including Personal, Studio, Agency and Enterprise. The prices range from $20 a month to $240 per month and above. Minimum 30 GB SSD storage and 2 websites are offered for the Personal plan which goes up to 1 TB of SSD storage and 250 websites. Shared hosting is offered under the Grid plan and includes Pro, Agency and Agency+ plans. The Pro plan includes 10 websites, I TB bandwidth capacity and 20 GB disk space. This goes up to 50 websites, 5 TB bandwidth capacity and 100 GB disk space for the Agency plan. Prices start at $30 per month and go up to $350 per month. Media Temple offers 3 VPS hosting plans. The Self-managed VPS plan starts at $30 per month and includes up to 64 GB Ran, 500 GB storage and 8TB bandwidth. Managed VPS starts at $55 per month and includes up to 64 GB Ran, 600 GB storage and 8TB bandwidth. The Fully-managed VPS starts at $249 per month and includes up to 128GB RAM, 1TB disk space and 10B bandwidth. Fully Managed Cloud Hosting starts at $499 per month and is aimed at agencies, businesses, content creators and developers. Dedicated hosting is offered to business clients and begins from $2000 per month and offers server management, customer support, root access and managed services. Enterprise hosting offers customized solutions to the business data management needs of clients. Media Temple offers an impressive uptime of 99.99% considering the fact that 99.5 is regarded as acceptable level of uptime in the industry. In addition to offering a high level of uptime to clients, the company offers 20% discount off the monthly rate to clients if 20 minutes of downtime is experienced by the clients. Since Media Temple has been around for a long time, they have been able to overcome most of the drawbacks. Some of the lingering problems include the slightly more expensive rates compared with other web hosts. Media Temple offers attractive coupon discounts of up to 30% off shared, WordPress and VPS hosting. In 2014, Media Temple won the Gold Stevie Award for Cloud Tech support team due to the superior quality of its customer service in addition to three other awards. Apart from that, the company is also featured regularly in the technology press including publications such as Network World, SocalTECH, and the Web Hosting Industry Review. Media Temple maintains a dynamic social media presence and its Twitter account has been especially adapted as a customer service portal.